Bold, fun art by Bay Area Artists. A story in every piece. Every sale supports local indie art creators. Pop Art, Nature, & Nerd Inspired Premium-Soft Graphic Tees. Our shirts use 3 fabrics blended together for ultra softness, durability, great looks, and lightweight performance. We team up with Bay Area community artists to help them share their work and earn a living, keeping their art alive. 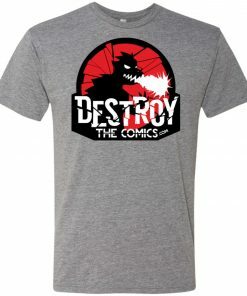 Unique, fun, & fantastical(sm)artwork from talented local creators. We handpick every authentic, one-of-a-kind design! 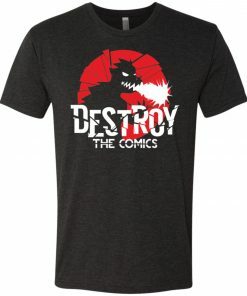 Who’s Destroy the COmics Anyway? We started as a couple nerdy guys with a blog on comics/pop culture. We’re visual people–we admire the art of comics, TV, movies, and games. But we wanted to go beyond being consumers of art. We wanted to help support the unrecognized creators around us who make great art deserving an audience. If you’re anything like us, you’re a visual geek who still cares about comfort. 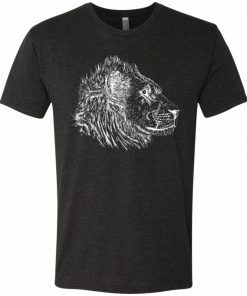 That’s why we focus on unique, fun, and fantastical artist designs custom printed on Triblend fabric T-shirts with superior softness, durability, and performance. We’re all about the wonders of the imagination, the creativity of dreams, with visual style that’s about having fun. Curious? Learn more about our story here. We’re not just a merch shop. We like to rock out like true party nerds.